News Items – Thomas Graham, Jr.
Graham, Thomas, Jr. and Jonathan Granoff. Opinion. “Trump’s Nuclear Treaty Withdrawal Weakened the West and Unleased Russia.” Newsweek. 25 Feb. 2019. Comments (26 Feb. 2019) by Giles Raymond DeMourot on Graham/ Granoff Newsweek 2-25-19 op-ed. Response by Thomas Graham, Jr. and Jonathan Granoff to Giles Raymond DeMourot on their Newsweek 2-25-19 op-ed. Graham, Thomas, Jr. (Fran Kelly, audio Interview.) “Russia follows US in suspending Cold War era INF nuclear missile treaty,” RN Breakfast, ABC Radio, Sidney, Australia, 4 Feb. 2019. Hall, Bennett “Just Say No to Nukes,” Corvallis Gazette-Times, 29 Jan. 2018. Graham, Thomas, Jr. Opinion. “Look beneath the bellicose rhetoric on North Korea,” Richmond Times-Dispatch, 19 Aug. 2017. Graham, Thomas, Jr. Opinion. “Congress Must Preserve the INF Treaty with Russia,” The National Interest, 19 Jul. 2017. Graham, Thomas, Jr. Opinion. “Don’t Enshrine A Russian Advantage In Surveillance Flights Over the US,” Defense One. 17 Jul. 2017. The Military Hailed a Successful Missile Defense Test in May. Here’s Why It Could Make Us Less Safe,” Politico, 28 Jun. 2017. Graham. Thomas, Jr. Opinion. “Time to Negotiate: Diplomacy is the Only Option and Pyongyang May Be Willing to Listen,”US News and World Report.” 23 Jun. 2017. Graham, Thomas, Jr. and Byron Dorgan, “Trump Makes Nuclear Mistake on Arms Control Treaty with Russia,” The Hill. 16 Feb. 2017. Frassica, Matt. “Career Devoted to Cutting Back Risk of Nuclear War.” Louisville Courier Journal 13 Sept. 2010. Graham, Thomas, Jr. “123 Agreement for Nuclear Energy in the UAE: An Unprecedented and Responsible Step.” World Post 7 Mar. 2009. Max Kampelman and Thomas Graham Jr. “Restoring US Nuclear-Free Leadership.” Washington Times 2 Apr. 2008. McNamara, Robert S. and Thomas Graham Jr. “A Pretty Poor Posture For a Superpower.” Los Angeles Times 13 Mar. 2003. Graham, Thomas, Jr. “Beware of Fracturing Peace in Space.” Globe and the Mail, Toronto 1 Apr. 2002. 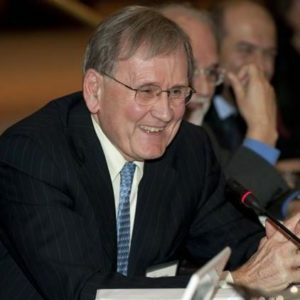 McNamara, Robert S. and Thomas Graham Jr. “Nuclear Weapons for All? ‘The Posture Review.’” International Herald Tribune 14 Mar. 2002. McNamara, Robert S. and Thomas Graham Jr. “Bush ABM Stance Endangers America.” Boston Globe 13 Jan. 2002. Gottemoeller, Rose and Thomas Graham Jr. “Dampen Nuclear Dangers in India and Pakistan.” Christian Science Monitor 15 Nov. 2001. Graham, Thomas, Jr., Victor Alessi and William Schneide. “The Laboratories of Democracy.” Washington Times 22 July 2001. Robert S. MacNamara and Thomas Graham Jr. “Nuclear Arms Still Keep the Peace.” New York Times 15 July 2001. Graham, Thomas, Jr., John B. Rhinelander and Alexander Yereskovsky. “Caution On NMD.” Moscow Times 1 Sept. 2000. Graham, Thomas, Jr., Robert McNamara and Jack Mendelsohn. “NATO–Peace–Would Gain From a No-First-Use Policy.” Los Angeles Times 15 Dec. 1999. Graham, Thomas, Jr. and John B. Rhinelander and Alexander S. Yereskovsky. “An ABM Olive Branch.” Moscow Time 28 Sept. 1999. Graham, Thomas, Jr. and Elizabeth R. Rindskopt. “Time for A No-first-use Policy.” Christian Science Monitor 28 Jan. 1999. Graham, Thomas, Jr. and Elizabeth R. Rindskopf. “Best Tritium Decision Might Be No Decision.” Seattle Post-Intelligence 15 Dec. 1998. Woollacott, Martin. “Shrines to Destruction.” Guardian 28 Nov. 1998. Graham, Thomas, Jr. Letter. Washington Post 3 June 1998. Graham, Thomas, Jr. “Japan has chance to scale back nuclear-weapons threat.” Nikkei Weekly 35.1 8 Sept. 1997. Smith, R. Jeffrey. “Retiring From the Agency, But Not From the Cause.” Washington Post 1 July 1997. Graham, Thomas, Jr. Press Release. “The United States Commitment to Indefinite Extension without Conditions of the NPT is Unwavering.” Committee for the 1995 Conference of the Parties to the Treaty on the Non-Proliferation of Nuclear Weapons. 26 Jan. 1995. Graham, Thomas, Jr. Press Release. “ACDA Team Visits Pakistan.” 28 Feb. 1994. Graham, Thomas, Jr. Letter. “Nuclear Treaty Lets Us All Breathe Easier.” Washington Times 1 July 1993. Graham, Thomas, Jr. Letter. “SALT and Voluntary Restraint.” Wall Street Journal 19 Mar. 1979.